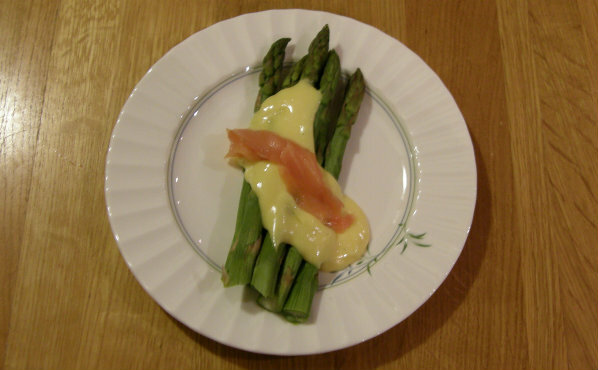 If you love asparagus but have never tried it with hollandaise sauce you need to have a go at this recipe. There are a few variations to the recipe but they are all pretty similar. Just egg yolks, lemon juice / white wine vinegar, butter and seasoning. How hard can it be? The recipe is very simple and its quite quick to make but you can end up curdling the sauce. Looking on the bright side, if it does curdle it won't have taken you long to mess up! Put the white wine vinegar and the lemon juice in a small pan and heat until very hot and bubbling. Watch it carefully as such a small quantitiy will get very hot very suddenly. Remove from the heat and again with the blender running very very slowly pour into the egg mixture. Stop every so often to give it time to blend in well. if it starts to look like its going to curdle keep blending without adding any more butter until you have rescued it. You can prepare the hollandaise sauce in advance but keeping it warm or warming it up must be done with care. If you apply too much heat too quickly it will curdle. Put it in a dish and reheat it over a bath of boiling water whisking as you heat. Alternatively Delia Smith recommends putting it in a wide mouthed thermos flask to keep warm. One of our favourite chefs has chosen hollandaise sauce as an accompaniment to asparagus as his favourite recipe to share with us. It is after all the classic sauce for asparagus. In order to make a lighter hollandaise sauce that is less likely to curdle when you reheat it follow the intructions above but then whisk the egg whites until they are stiff and fold them into the sauce. The egg whites will stabilise the mixture stopping it from curdling. This is another tip courtesy of Delia.